After having the honour last year of reading stories for children (courtesy of the Golden Baobab), I realised that I really did not pay enough attention to Children’s Literature. While I was thinking of a way to rectify that, a few months ago Kate Iffy Chukwu contacted me asking if I would review her new collection of stories for children. Her request could not have come at a better time. ‘In A Week of Tortoise Tales, I have kept to the oral tradition of storytelling while also making it relevant for modern young readers and listeners. Older children will find the tales fascinating. Parents and grandparents will also find the tales appealing to share with children of all ages. These short and simple tales are just right for everyone’. Each story is described as ‘five minutes of fun!’ and boy are they fun. On Monday, tortoise learns to fly purely because he ‘was bored. He wanted to do something exciting’. On Tuesday, Tortoise was hungry and helps himself to some sizzling stew made by goat. Sadly on Wednesday, Tortoise was very sad as his cousin was getting married soon and ‘he had no money for a good outfit’. But clever Tortoise finds a way to get some money. By Thursday, Tortoise decides he is not going to play any more tricks, but come Friday, Tortoise finds himself in another competition. On Saturday, tortoise seems to be getting fatter and fatter thanks to his secret magic tree and on Sunday, Tortoise tries to help catch a thief in the animals’ farm. The book ends with a blank page where children can draw their own tortoise or favourite animal. In between the stories, there are fun and interactive questions – some based on the stories themselves and others on more broader themes raised in the stories, such as the kindest thing ever done, an important lesson learnt today and so on. Honestly, the idea of a story a night for the week is brilliant. I also love the illustration. I know its meant for kids, but I really enjoyed reading it and finding out what tortoise was up to. I even gave it to my mum and asked her to read it – as she used to read bedtime stories to us so I wanted to know what she thought – and she really enjoyed it as well. 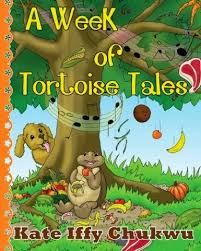 Now all Kate Iffy Chukwu needs to do is publish Another Week of Tortoise Tales.